View a high resolution version of the survey infographic. New Zealand’s game developers earned a record $143.0M in the financial year ending 31 March 2018 according to an independent survey of New Zealand Game Developers Association studios. That’s 43% growth since last year when the sector first passed the $100 million mark. 93% of that revenue came from exports of digital creative entertainment software. Employment in the sector also grew 10% to 550 full-time roles. The overall industry outlook continues to look good, with 63% of studios expecting more than 10% growth in the coming year. This optimism is reinforced by several local game studios having announced further successes since the survey closed. Bloons Tower Defence 6 by West Auckland-based Ninja Kiwi became the number one paid app in the world, ranking above Minecraft, on both the Apple and Android app stores when it launched in June. 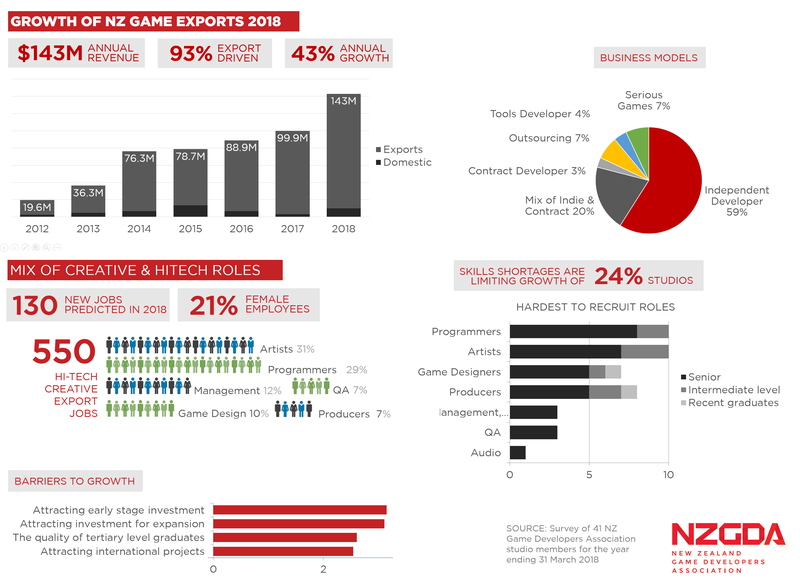 Local studio Grinding Gear Games was acquired by the world’s largest games publisher Tencent for over $100M – one of the largest tech exits in New Zealand history. Those successes come from studios developing and exporting their own original game IP, rather than contracting for publishers or Hollywood studios. This continues to be the most profitable business model, making up 77% of the industry’s revenue – an increase on previous years. However, it requires more initial development and marketing investment which is lacking in the New Zealand ecosystem. Revenue from contract work (12%) and selling advertising in games (7%) has remained constant, but accounts for a smaller percentage of industry revenues as profits from original IP investments take off. Video games is one of our fastest growing creative careers, with studios expecting to employ another 130 people in the coming year.